Cut Notes: 72 players at 3-over-par 147 from a field of 120 professionals. Weather: Thursday: Mostly sunny and pleasant with highs in the mid to upper 70s. High of 76. Winds NE 8-12 mph. Friday: Scattered storms with periods of heavy rain. Cooler temperatures into the afternoon with a high of 58. Winds W 15-20 with gusts up to 28 mph. Overnight rains totaled .88 inches. Play was delayed from 9:44 a.m.-11:32 a.m. (1 hour, 48 minutes) due to heavy rain and thunderstorms. Saturday: Cool and clear in the morning with temperatures hovering around 57 degrees. Winds W 15-20 with gusts up to 30 mph. Warmer in the afternoon with temperatures reaching 70 degrees. Sunday: Sunny and warmer with temperatures reaching 75 degrees. Winds W 15-20 with gusts up to 28 mph. Jack Nicklaus wasn’t surprised that Tiger Woods matched him for career wins on the PGA TOUR. The manner in which Woods achieved it, however, was quite an eye-opener, even for the Golden Bear. With a magical flop shot from behind the green on the 16th hole that Nicklaus called, "the most unbelievable, gutsy shot I’ve ever seen," Woods birdied three of the final four holes and captured his fifth victory in the Memorial Tournament presented by Nationwide Insurance. The victory was Woods’s 73rd on the PGA TOUR, tying Nicklaus for second all-time behind Sam Snead’s 82 wins. "He had to rub it in my face right here, didn’t he?" Nicklaus quipped, laughing. "No, if he's going to do it, which he was obviously going to, I'd like to see it happen here. And the way he did it, you know, he just played great." The way he did it was familiar to those who have watched Woods regularly pull off uncanny shots. This time it was a 50-foot flop from behind the 16th green. Trailing by two strokes at the time, Woods assessed a scruffy lie in thick rough after knocking a 7-iron over the green at the recently redesigned par-3. Without regard to the water hazard beyond the hole, Woods took a huge swipe at the ball, watched it land softly and then track towards the cup. 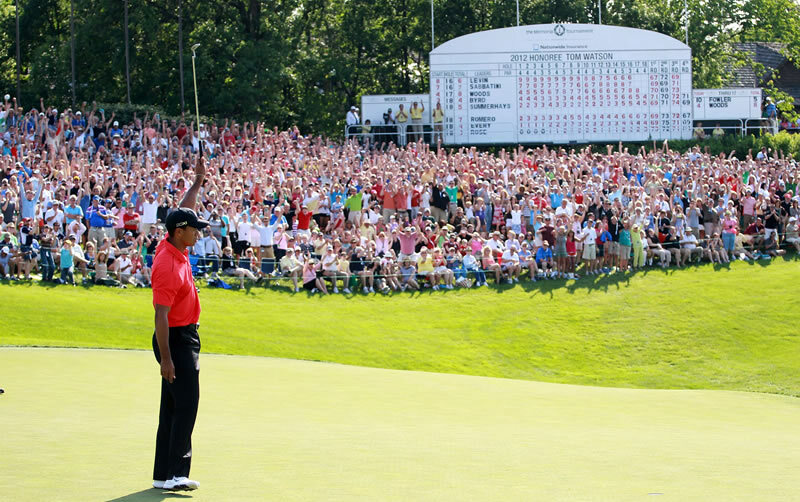 When it went in, Woods unleashed a muscular fist-pump as the gallery whooped and roared. "Look at the position he was in," Nicklaus gushed. "If he’s short, the tournament is over. If he’s long, the tournament is over. He puts it in the hole. What a shot. I don’t think under the circumstances I’ve ever seen a better shot." "It’s one of the hardest ones I’ve pulled off," Woods, 36, conceded after his second win of the season. "The shot was really difficult, but it wouldn't have been so bad if I had a good lie. The lie was just a little bit marginal where it brought water into play. I went for it. I pulled it off, and for it to land as soft as it did was kind of a surprise because it was baked out and it was also downhill running away from me. It just fell in. I didn't think it was going to get there at one point. Kind of like 16 at Augusta, I thought I was going to leave it short somehow, and then it fell in." Playing partner Rickie Fowler, who struggled to an 84 Sunday, also was reminded of the shot Woods holed at 16 at Augusta National GC on the way to winning the 2005 Masters. "He had obviously a shot that, I guess not lucky, but you hit a good shot to get it inside 10 feet, and it came out perfect, landed kind of right on the crown of that ridge there, and the rest is history," said playing partner Rickie Fowler, who fell out of contention with an 84. "He loves being in the moment, and that's where he kind of gets down, focuses and hits those shots. He hit a perfect shot, and it was the perfect time to do it." Woods, who closed with a 5-under 67 and 9-under 279 total, is the fastest in PGA TOUR history to get to 73 wins at age 36 years, 5 months, 4 days. Nicklaus, of course, captured his final victory in that electric 1986 Masters, at age 46. Sam Snead, who holds the record of 82 wins, was nine days past his 43rd birthday when he won the 1955 Palm Beach Round Robin for win No. 73. "It's awfully special to just have won this event, and to do it here with Jack obviously there at 18, it's awfully special for us as players to have him there and to greet us after we finish … and to do it at such a young age, it feels really special." Woods started the day four strokes behind Spencer Levin, but he wound up with a two-stroke victory over Andres Romero and Rory Sabbatini. Romero matched Woods for low round of the day with a 67. Sabbatini shot 72. Levin, seeking his first win on the PGA TOUR, ended up tied for fourth after a 75.